The Ancient Order of Hibernians in America granted a charter to Division 61 in Philadelphia on October 1st, 1895. The organizer was William J. O'Rourke. Who was Joseph Patrick Schickling? Joe was the embodiment of the AOH creed: Friendship, Unity and Christian Charity. Joe was an employee of Harbison Dairies for 43 years, hence the nickname "Joe the Milkman". Along with his wife Ellen of nearly 60 years, they raised nine children and still found time to serve the Division in practically every capacity. Joe was a perennial delegate to both state and national conventions. As if all of the above was not enough, Joe contributed are good deal of time to organizing fundraisers, delivering donated goods to needy families, and selling chances. Joe's Irish heritage came mainly from his mother's side, the Ronoghan's. Joe loved being Irish ... and he loved being a member of the Ancient Order of Hibernians. For these reasons and more, the Division elected to honor Joe's memory by naming 61 after him in 1985, four years after his death. Joe not only lives on in name and spirit, he lives on through Division 61's membership which currently enlists three of of his sons (the late Jimmy Schickling was a former member also), a son-in-law, seven of his grandsons and the spouses of three of his granddaughters. Division 61 has its roots in St. Michael's parish at 2nd and Master Sts. Many of the current members trace their roots back to North Philadelphia, Fishtown and Kensington. 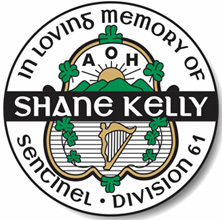 Division 61 is comprised of numerous families, fathers and sons, uncles and nephews, son-in-laws, and brother-in-laws. They have spread out all over the Delaware Valley: all over the Northeast (Mayfair, Lawndale, Tacony), Montgomery and Bucks Counties, and South Jersey. Christmas is for Giving Race - We co-sponsor this toy drive with the Northeast Roadrunners and McCafferty-Sweeney Funeral Home. Gifts and food are distributed to more than 60 families in the Northeast. Thanksgiving and Easter Food Baskets - Member donations help needy families in the Visitation parish (Joe and Ellen Schickling were married there and a number of our current members hail from Visitation. Heart of Camden - Each Christmas season our members contribute food, labor and money to support a food drive at Sacred Heart Parish in Camden, N.J.
St. Vincent's Home for Children - For the past two years we have provided packages of school to help some of the children at the home. Project Children - Division 61 actively supports Sister Francis Kirk, SSJ and this effort. Hibernian Hunger Project - The Division actively supports this effort which provides food to thousands of people in the Philadelphia area. 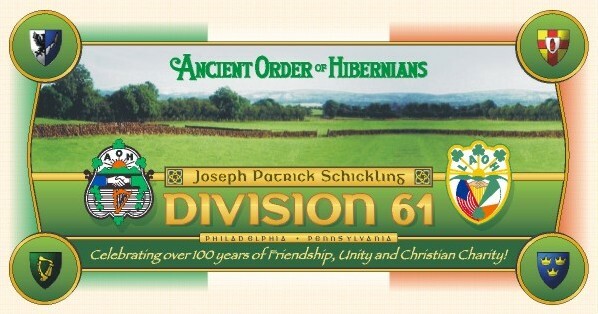 Division 61 is benefiting from the revitalized interest in Irish heritage in the Philadelphia area. Our AOH membership is now over 200 members and growing. And the LAOH has over 100 members. We look forward to continue living by our creed: Friendship, Unity and Christian Charity.